K. Brunini Jewels launches“Shapes of Strength”, a unique and timeless bridal collection for the alternative couple looking for intimate, organic and sentimental design inspirations. Designer Katey Brunini’s vision for the collection combined poetry, love stories, fire, passion and endless love; therefore the launch has become a multi-sensory experience with quarterly music videos, poetry, sensual photography and real life proposals. Brunini cites L’isola che non c’e as her inspiration, where her signature design elements of Twig, Vertebrae, DNA, Spider Web, Skipping Stones, Body Armor and Objects Organique live in perfect harmony. In keeping with her unusual design aesthetic of using rare gifts from Mother Nature, Brunini combined an unexpected marriage of stones in “Shapes of Strength” including: Trapiche emeralds, Morganite, yellow beryl, Ceylon sapphires, rubies, Herkimer quartz crystals and diamonds. A true supporter of the alternative bridal category, K.Brunini showcases jewelry for both women and men in the 2012 collection including engagement rings, wedding bands and modern bridal day jewelry.With this debut of more than 100 new engagement rings and wedding bands, Brunini uses multi-colored diamonds and rare gemstones in both center and side stones. With settings in 18K rose, yellow and white gold, and platinum, the textures in the bands complete the unity circle. Predominant in the line are Twig, Antler and Vertebrae textures which offset rose cut diamonds, fancy shaped center stones and a variety of colorful diamond/gemstone accents. A majority of the collection falls in price points between $300 and $10,000 for engagement rings and wedding bands. Standouts include a six carat radiant cut diamond with emerald trapiche cabochons in 18K rose gold Vertebrae, a Herkimer diamond crystal set in 18K yellow gold eagle talons with diamond tips, and a sweetheart engagement ring with diamond center and ruby sides set in 18K rose gold Vertebrae. “Just as every bride is an individual, every commitment ring should be as unique as they are,” states Brunini. “The engagement/wedding ring becomes a symbol of a new family’s legacy and I take honor and pride in designing pieces that will represent that union until the end of time. The bridal jewelry created for the big day and beyond embraces rare and luminous South Sea pearls mixed with diamonds and three colors of 18K gold. Brunini accentuates a brazen femininity with the pearl drop earrings, statement making pendants and smooth stackable cuffs (tested not to snag or catch on the dress). 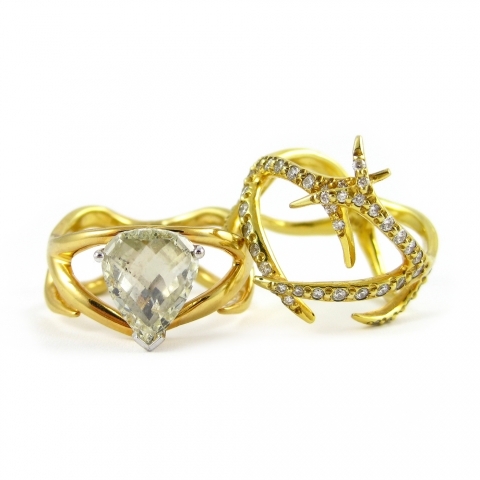 She gives homage to vows of marriage by making each piece a tribute to the rarity and everlasting essence of love. In addition to the more organic pieces are classic, understated mainstays of stud earrings, pearls by the Twig yard and bangles that can be worn daily—and forever. Katey Brunini and her team take pride in making jewelry to be worn and cherished by generations of unique individuals. K.Brunini’s creations adorn celebrities, collectors and world leaders. Her designs can be found in fine retail jewelry stores and museums from coast to coast. For more information on K.Brunini Jewels log on to www.KBrunini.com.